I was complaining about how my trunk lid doesn't open fully enough just last week. I had hit the popper on the remote on a windy day, and went to pull the trunk lid open and the wind caught it. I then realized that I'll be okay just lifting it up. Web site was German only that I saw. Help me out here. EDIT OK, looked around and found a post from Davhamm. Good to go just email him, wait on paypal invoice, send money , DONE. I agree with Robo, after fitting the gas trunk lift/piston, it definitely feels like this is how it should have been built by GM but maybe they didnt have any gas shocks in the GM parts bin when they built our Kappas! Solstice mount space look like Sky? If I had enough hands and arms I could hold the camera and the lower bracket in place. 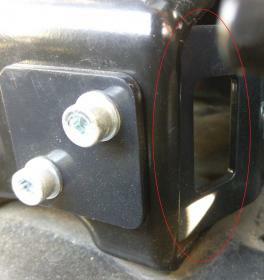 As it is, here's a photo of the mounting place on my Solstice for the trunk lifter. 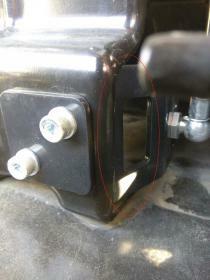 Upper bracket mounts on the two bolts on the lid hinge attaching place easily per instructions. In the photo you can see the little square opening that's been giving me concern. 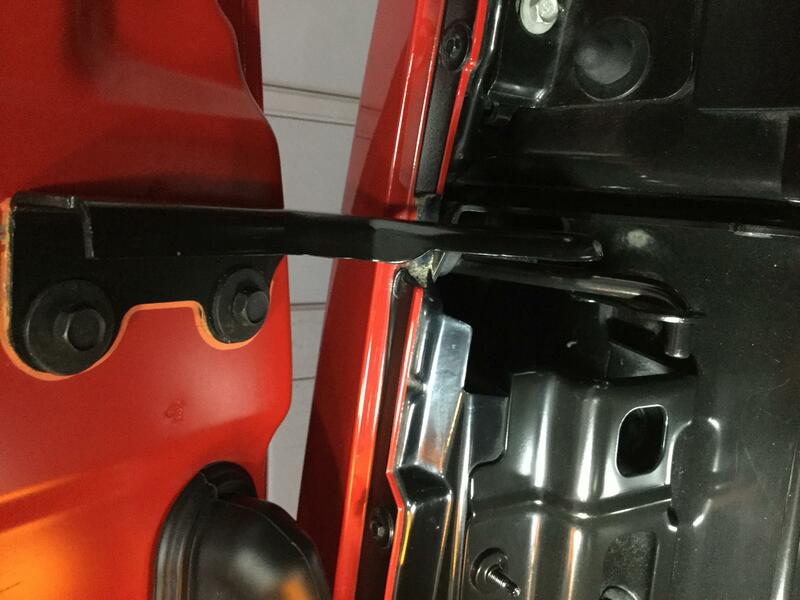 Well, holding the bracket up behind the brace opening has the diagonal bolt holes at opposite corners very snugly positioned so the bolts, washers and the cover plate would cinch up in alignment. I still think I'll add star lock washers for belt and suspenders effect. I'll post again when installed. Anyone who wants to verify the Sky is the same or different, please do so. My thanks to all who've commented so far. I still want to see a Sky fitment location. I'll post again when installed. Anyone who wants to verify the Sky is the same or different, please do so. My tanks to all who've commented so far. I still want to see a Sky fitment location. Would love to but can't get the trunk open, trickle charge does not seem to be working, and I don't think my jumper cables are long enough and I don't have a battery pack. Somehow I will figure this out. I got a close up of the mount point in my Sky and it seems to match you picture too. 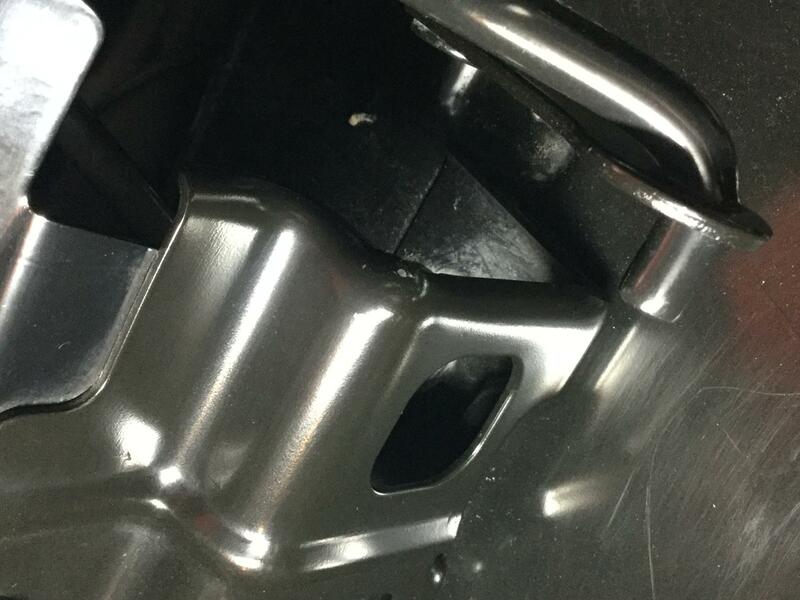 It looks like the bracket (in the red circle) is square in shape and fits in the opening from the back side. Once bolted from the front side, its shape would not let it move or twist. Last edited by jgassor; 03-31-2017 at 06:21 PM. Here you go. Structure looks the same. My pictures would look that good if I would just get off my *** and clean my Sky! LOL, thanks jgassor...my cars been in hibernation all winter. Just popped the trunk for the pics. We got Jamie's rear tow hook installed tonight for autocross (dear god I hope we don't need it) so we'll be seeing you in the morning Jassor. I couldn't remember for the life of me remember how that went together. Jim and SSR e2015, excellent photos, thanks guys. Shows the Sky and Solstice are identical where this lifter mechanism mounts. Should help those considering the mod move forward. I had very good communications with Werner, the price was reasonable and shipping was fast (until the non-communicative USPS was involved). I will have to detail the area before installing. Take care and may we enjoy the bit of Spring left for April. Dealing with Werner was great. Got my support in a week. Does anyone have an URL for them or is it in the "Merchandise" section?